If you haven't noticed yet, we are now managing our support communications using a cloud-based customer service platform called Zendesk. You can visit the GoldSim Help Desk here: http://support.goldsim.com/. After spending about a month evaluating Zendesk, we decided that this would be an excellent system for helping to track and document interactions that we have with you. It's also a great environment for maintaining a knowledge base of helpful support articles. 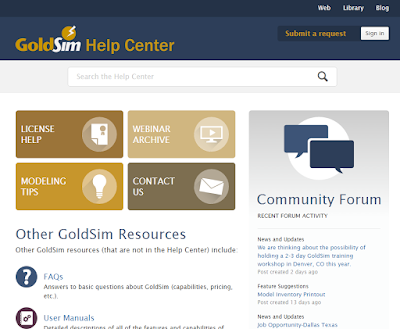 Submitting a support request: To submit a support request directly to our help desk system, visit the following link: http://support.goldsim.com/. There you will see a 'Submit a request' link in the upper right of the page. Note that there is also a ‘Sign in’ button. If you have created an account, you can sign in to see all of your support tickets with GoldSim. If you have not yet created an account and you wish to do so, click the ‘Sign in’ button and then click the ‘sign up’ link to create an account. However, note that you do not need to have an account in order to submit a support request. Simply click on the ‘Submit a request’ button and you will be presented with a form where you can provide your email address, a subject and a description of your question or issue and also upload files as attachments. There are also fields to provide additional information such as the version of GoldSim you’re using, your operating system and your license registration code. This additional information may be helpful to us when dealing with a license issue or a possible bug in GoldSim. Submitting requests from the GoldSim website: If you visit our main GoldSim website (http://www.goldsim.com), you may notice a ‘Support’ button that appears in the lower left of all the pages. When you click on this button, you are presented with a form where you can submit a support request that will be sent to our help desk system and a new ticket will be created. What about support@goldsim.com? 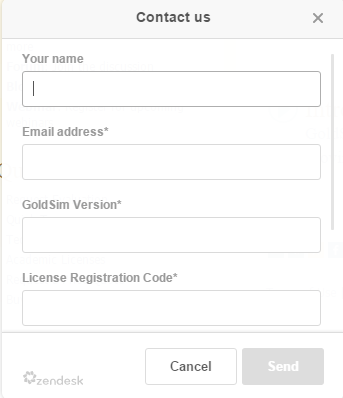 You can still also submit support inquiries to support@goldsim.com. These will automatically be forwarded into our help desk and a new ticket will be created. When a ticket is created, you will receive an automated email informing you that a ticket was created. Here, internally, our support agents will also receive automated emails so that we are informed immediately of your request. One benefit of submitting your request by email to support@goldsim.com is that you can copy any colleagues that you wish to be on the ticket as well. Note about license-related requests: If you wish to purchase a GoldSim license or renew your maintenance subscription on an existing license, please submit your request to software@goldsim.com. If you have an issue with your license (for example, you have a license that has stopped working for some reason), or you have general questions about different GoldSim licensing options, then go ahead and submit these kinds of requests to our help desk.